Epacadostat is a potent and selective IDO1 inhibitor with IC50 of 71.8 nM±17.5 nM. IDO-IN-1 is an indoleamine-2,3-dioxygenase (IDO) inhibitor with IC50 of 59 nM, shows activity in Hela cell (IC50=12 nM). IDO-IN-8 (NLG-1487) is an indoleamine 2,3-dioxygenase (IDO) inhibitor extracted from patent WO WO2012142237A1, compound 1487, has an IC50 of 1-10 μM. 8-Nitrotryptanthrin is a potent human indoleamine 2,3-dioxygenase 2 (hIDO2) inhibitor which significantly reduces IDO2 activity with Ki of 0.97 μM. 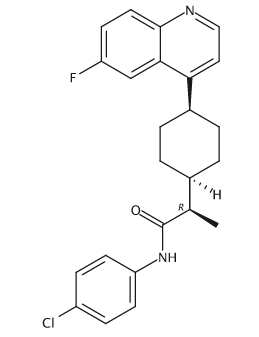 PF-06840003 is a highly selective orally bioavailable IDO-1 inhibitor. Coptisine chloride is an alkaloid from Chinese goldthread, and acts as an efficient uncompetitive IDO inhibitor with a Ki value of 5.8 μM and an IC50 value of 6.3 μM. Navoximod is a potent IDO (indoleamine-(2,3)-dioxygenase) pathway inhibitor with Ki/EC50 of 7 nM/75 nM. 1-Methyl-D-tryptophan is an inhibitor of the enzymes IDO and INDOL1 (indolamine 2,3-dioxygenase 1 and 2) with selectivity for INDOL1. INCB024360 is a potent IDO1 inhibitor.